The need for The Orchard ministry in Pucallpa is overwhelming. In the surrounding region there is currently only one government-run children's home serving a population of more than half a million people. And among this population, many children suffer from severe mental and physical disabilities – needs that are difficult to address in the current environment. Each family-style home will be led by loving house parents and provide care for ten children. The Orchard will also provide a quality education focused on preparing for independence, all with a Christian emphasis. The first home will open soon – this is much needed in an area where there is very little support or care provided to orphaned or abandoned children. The Orchard will provide hope and restoration for children who have suffered the worst forms of physical and sexual abuse. Children will attend local schools, have the opportunity to reach their full potential, and be prepared to become impact Christians in their communities. Over time, this ministry will grow to four homes for 40 children. 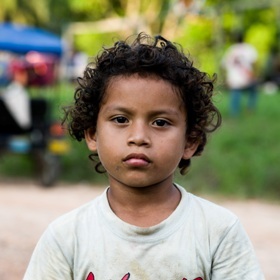 Supporters of the exciting new ministries in Pucallpa will be part of seeing vulnerable and desperately poor children break the cycle of poverty and experience the joy of knowing Jesus. Support the Ministry of Orchard Children's Home with Your Gift Today.